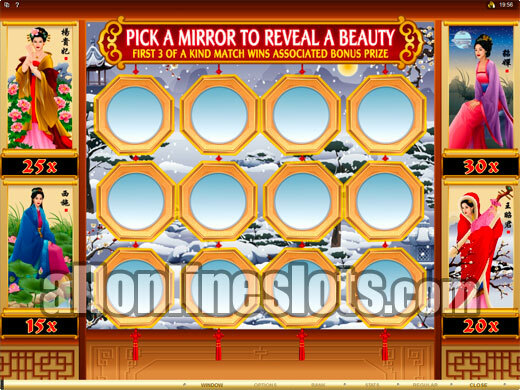 Asian Beauty joins a long list of slots with an Asian inspired theme. The game uses the 243 Ways format and has two bonuses with free spins and a randomly awarded Mirror Bonus where you can win up to 9,000 coins. 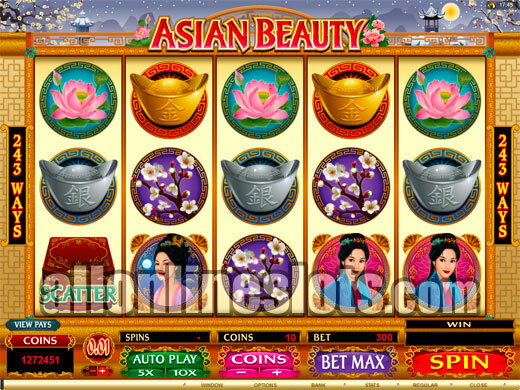 Asian Beauty is part of the 243 Ways slot range found at Microgaming online casinos. 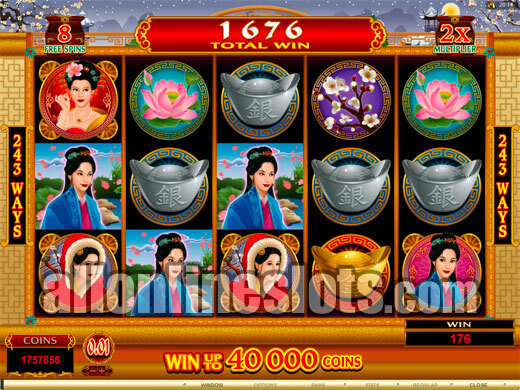 A the name suggest's the game has an Asian inspired theme the symbols such as lotus flowers, blossoms, crowns and several ladies which is where the beauty comes in. The game also has two bonus features and a top jackpot of 2,000 coins. Like all 243 Ways slot machine you do not need to bet on the individual lines. Instead a 30 credit bet covers all 243 Ways. If you want you can choose to bet up to 10 coins per way which makes for a max bet of 300 coins per spin. Coin sizes are between 0.01 and 0.50. 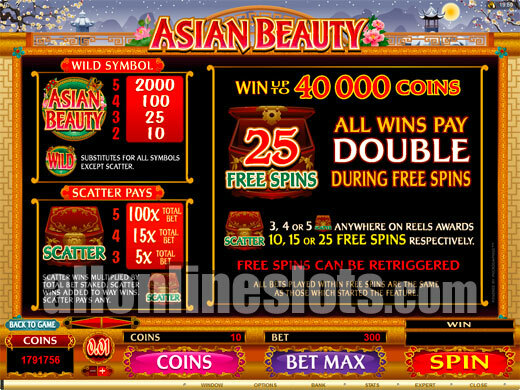 The Asian Beauty logo is the wild symbol with five wilds paying 2,000 coins multiplied by your line bet of up to 10 for a max win of 20,000 coins. Being a 243 Ways game if you do get five wilds you will also get a whole lot of other five of a kinds so you will win more than just the top pay of 2,000 coins. Asian Beauty has an interesting pay table in the fact that there are four ways to get the second highest pay of 200 coins. All four of the ladies pay 200 coins for five of a kind or 2,000 coins at max bet. It is unusual to have four different ways to win the second highest pay but this can only be seen as a positive. The scattered chest symbols are the way to the free spins with three, four or five winning 15, 20 or 25 free games respectively. The free games offer doubled wins which boosts the top jackpot to a handy 40,000 coins. The free spins can also be re-triggered. During the base game, Asian Beauty has a randomly awarded Mirror Bonus. There are no symbols on the reels to trigger this bonus it just randomly appears much like the "You Are Lucky" bonuses seen on some of the Aristocrat slots. Once won the Mirror Bonus takes you to a second screen game where 12 mirrors appear on the screen (View Screen). You then have four different multipliers displayed on the sides of the mirrors. You get to keep picking until you match three or the same ladies. You can win up to 30X your bet or 9,000 coins total. 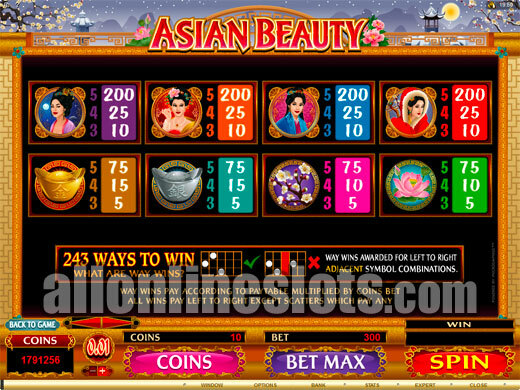 Asian Beauty offers a lot of good pays and has a high hit rate due to the 243 Ways format. The free games double all wins and the Mirror Bonus that hits randomly means that the excitement level is high for every single spin.